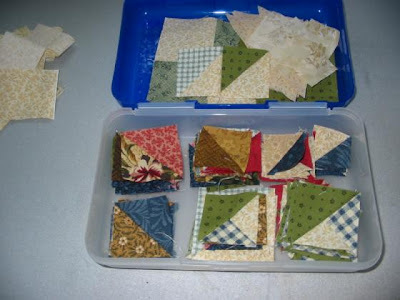 What do you do with all those pieces that you need to cut off when making flying geese or all the different style of blocks that I made for this Quilter's Garden? 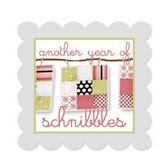 That is one thing I don't like about the patterns that Lynette Jensen designs. She does some of the steps in a way that you have too many discards. I learned early on that I wasn't going to throw all those pieces away. 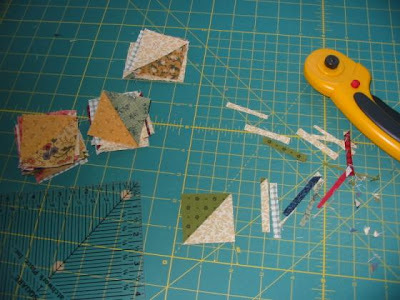 So started to do as Bonnie does, sewing back across those little pieces so that when I cut them off I will have another half square triangle block. Yes, after awhile you have loads of them so what to do--? First I press them open then start to trim them to a usable size. I have from 1 in to 3 and a half inch. Stack in their separate stacks. Then here is the little box with all the different sizes. 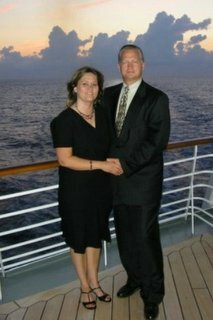 Here's what I made from them. Only added some small strips for orders. made the sawtooth strips for the outer boarder. Yes, and now it needs to be quilted. 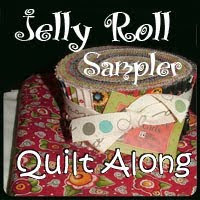 This will give me a little project to hand quilt while watching my one soap in the afternoon and the final week of baseball. Unfortunately my Orioles won't be playing in the play-offs. Maybe next year. Of course there is still loads of these HST to do something with. Gorgeous! What a great use of "freebies". I've been doing this with the quilt I'm making now, can't wait to see what the extra triangles will become! I've been saving mine too with no idea what to do with them. LOL. This turned out really pretty. I'll have to remember this one! This is one of my favorite settings for half square triangles. Lovely little quilt. Aren't you the clever one. Looks nice and just the size to hand quilt watching TV. I have bags(sandwich)of these. Now maybe I should start designing. Oh my another thing to keep me busy. Maybe in cold weather. Any way you got my juices flowing. Good use of the scraps, Eileen. 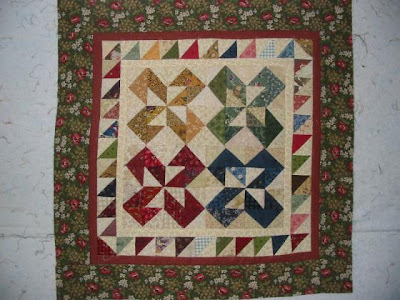 That little quilt looks so bright and cheerful!